That’s the view of our apartment tonight. For the 1st time since moving in July, we have no electricity. 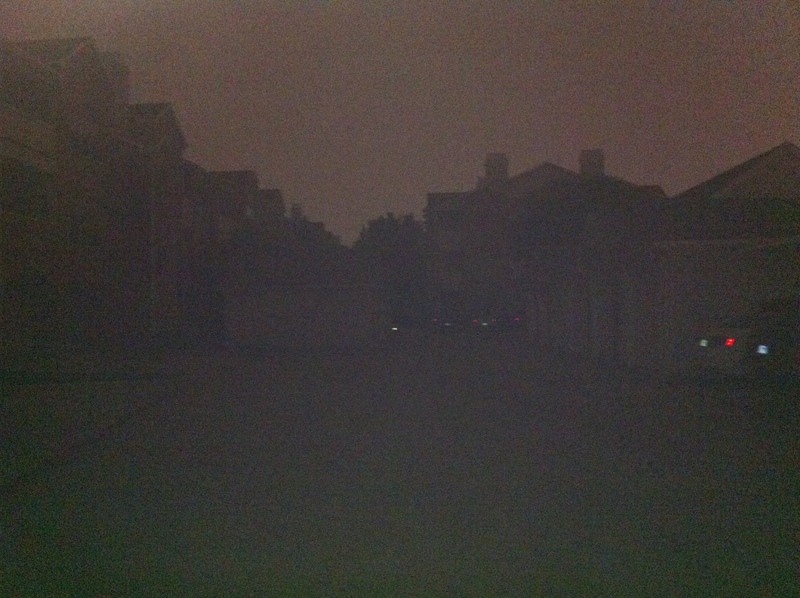 Two buildings in the complex have power, but ours doesn’t. Not a happy camper. Hope the food in our fridge is still good, we went shopping over the weekend. Lightbulb went out on Friday, only one part of the front gate opens, a big pothole that I used to hit all the time in the lot was finally fixed about two weeks ago. My knees are starting to hurt (tendonitis?) after walking up 40 stairs each time I go in and out. Writing on the wall.. It could always be worse though. New kitchen will require induction cookware, which means buying a new set for the kitchen. We went shopping around. Williams Sonoma has super high quality cookware but the prices I’ve seen are out of this world. Gonna keep on shopping around. We’re getting about 800 off at closing in exchange for doing it two weeks early, something with the first month’s payment and the seller not wanting to leave it vacant for 2+ weeks. I’ll also be switching my auto policy from Geico after 10 years to AllState. Got quoted less than I’m paying now even without a multi-line discount or joint policy holder discounts applied and what appears to be more perks (accident forgiveness and what not). I believe it’ll drop from 85/mo to being 40-50, for full coverage. That’s freakin’ sick. When I was 18 under my mom’s Traveler’s policy in 2001 insurance was $200/mo. Age, credit score and being responsible is definitely working in my favor.